Although I have mentioned Edradour in my blog before, I have never officially written about an Edradour tasting. So, I am kicking off the week with a distillery I’ve not officially written about. 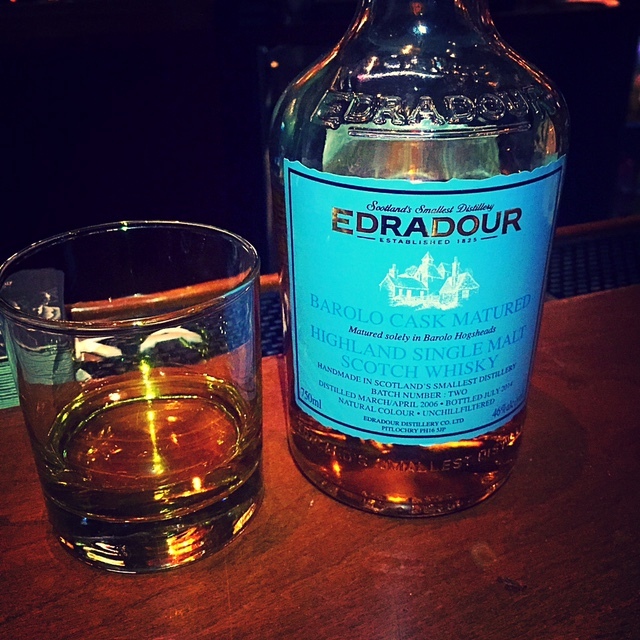 Edradour is known as one of Scotland’s smallest distillery. It’s a highland single malt that was first established in 1825. In 1982, Pernod Ricard bought the company and during this time Edradour was mainly producing whisky for blended whiskies. It was not till Signatory Vintage (independent bottlers first founded in 1998 by Andrew and Brian Symington) purchased the company in 2002 that Edradour began mainly producing single malts. The bottle I got a chance to taste is matured in Barolo (Italian wine) casks. It was distilled in March/April of 2006, bottled in July of 2014 and was a part of their 2nd batch. It was a perfectly balanced dram of whisky. There is a complexity to it however; all the notes blend harmoniously together. It was tasty and quite enjoyable. It wasn’t a whisky that completely blew me away, but it’s most certainly a good whisky. I would definitely recommend trying.